In which the mooses head below the South Rim and beat themselves up on their “easy warm-up hike,” finally find one of the Boston Museum benchmarks, and discover the healing properties of Fat Tire Ale. This Sunday morning dawned as clear and bright as all the others, but we weren’t as early to rise as usual. We lay in bed feeling great satisfaction in our stillness. Perhaps it was the warm feeling of anticipation, the assurance that no matter what happened that day it would be a fabulous adventure, and that this all awaited us just a few minutes’ walk away. But near the midpoint of that several minutes’ walk was the Maswik Cafeteria. And that’s where we paused briefly to refuel once we finally dragged ourselves out of bed and prepared for the day’s adventure. “Cafeteria” accurately captures the atmosphere and quality of food in this place. All extravagance is sent northward to El Tovar (or perhaps southward to the nearest McDonald’s). Kidding aside, all the victuals were edible, and they were reasonably nutritious and filling enough to get us through at least the early part of our trek. We shared a bare-bones breakfast burrito, a patty of peppery country fried steak, and potatoes, and drank down plenty of apple juice and coffee. This morning, the bus with the “Hermit’s Rest” sign was, in truth, going to Hermit’s Rest. (Imagine that.) It was packed, rickety, and raucously loud. It banged us around, up and down in our seats, as it picked and bounced its way north and then west on the West Rim Drive, which is obviously in need of repair. Our own vehicle would have been much more comfortable, in addition to being much more convenient, but I digress. 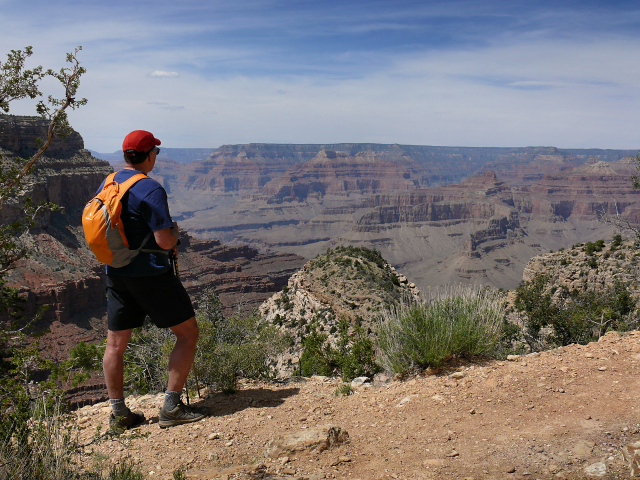 We passed by the overlooks of legend: Maricopa Point, Hopi Point. 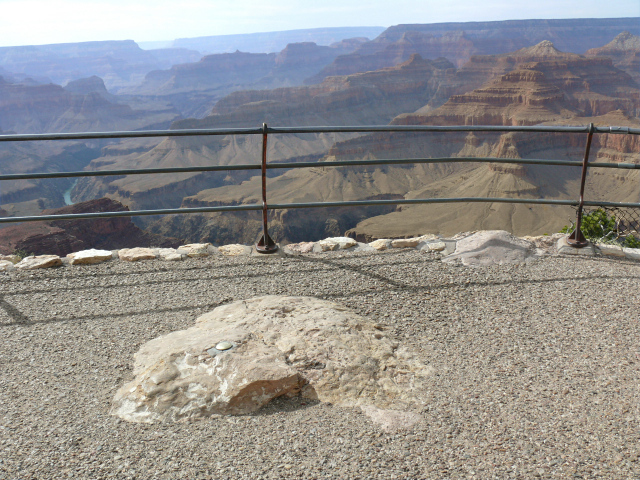 Mohave Point, and all those unnamed ledges interspersed between. I’ve studied the maps in such detail that they feel like old friends to me, even though Hopi is the only one I’ve encountered face to face so far. Hermit’s Rest is on my list to explore in greater depth next time. First, I know I missed out on at least one survey mark here. I’m not sure what I was thinking at the time, but for some reason I was unaware of it. Being GPS-less that morning (for the sake of traveling light) probably didn’t help — and no, contrary to some people’s long-held suspicions, I do not have every benchmark location, designation and PID (where applicable) committed to memory. In addition, I would like to explore the building at Hermit’s Rest more thoroughly. Designed by architect Mary E. J. Colter in 1914, the structure is designed so that the exterior nearly resembles a natural rock formation, and therefore it blends smoothly into its surroundings. It’s rustic in its appearance both inside and out. 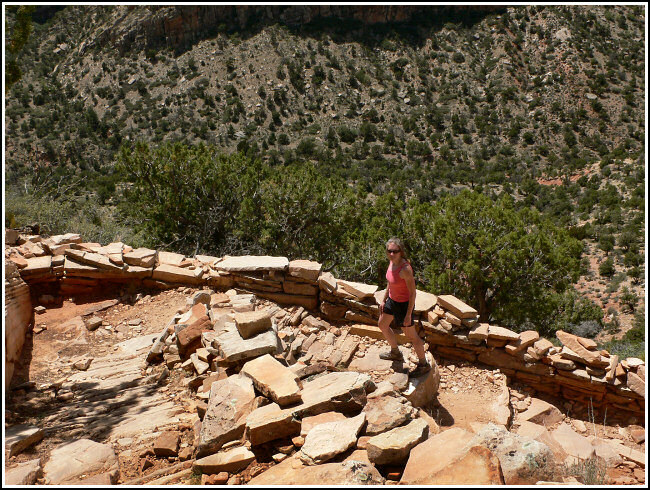 We barely breezed through the stone structure on our way to the trailhead, checking out its typical gift-shop and snack bar wares with little more than a passing glance, eager to get below the rim. It’s impossible to miss the most prominent feature—the arched stone fireplace set in a high domed alcove, with high windows opposite that allow for abundant sunshine midday. Adding some personal, colorful touches are an antique brass tea kettle and other kitchen implements, Navajo rugs, and rustic chairs and tables. And so we began our first hike down into the Canyon, en route to Dripping Spring or as far in that direction as our feet and our energy would take us. We began strong, hiking through a small forest of familiar juniper. Descending steeply almost immediately, the uneven and rocky trail took us through the famous Kaibab Limestone layer via a series of switchbacks. Many sections of the upper trail have been filled in with blocky cobbles, which give the trail a unique, almost paved look, but can be tricky to traverse. 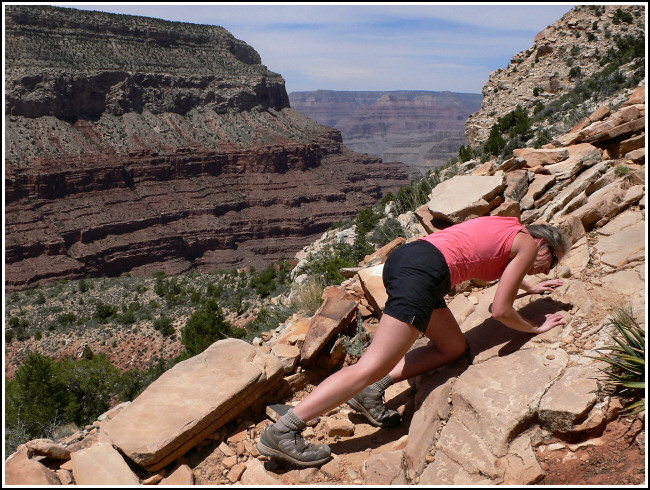 It’s probably still easier than heaving heavy legs and stiff knees over the large loose rocks we encountered on the first part of the trail. With very little shade and the day having already heated up into the 90s, Rich and I hiked as slowly as good balance would allow. We enjoyed the relative peace and silence of this trail. We stole every possible opportunity to cool down in the shade, talking and laughing together, marveling at the red and white stone of Eremita Mesa, the lush greenery all around, and again the lack of water carried by any of our fellow trail-walkers. I could stand for an hour at every turn, matching our progress and what lies ahead to the map, estimating the sizes of objects far more distant than I can imagine (those “little bushes” are really full-grown trees, “just amazing,” Rich said with a smile! ), wondering which hidden corners of this canyon still lie untouched by a single human being. At the base of a steep and slick descent between the junction of the Waldron Trail leading south and the northward turn of the Hermit Trail toward Santa Maria Spring, we crouched on some rocks beneath the only tree for a mile. Rich confessed that his knees were bothering him so much he would prefer if we could head back to the rim. I was perfectly agreeable; I never want to see him in pain! “It’s bittersweet,” he told me. He loved being there with me, but I could tell he was disappointed with the condition of his knees. With anyone else I would have felt some regret, but with Rich, it’s different. Just being able to share this adventure with him is a privilege and an honor, and infinitely interesting no matter what we do. I’ve surprised even myself because I’ve never had a desire to maintain this sort of patience with anyone else I’ve known, never got so much out of contributing to anyone else’s life and well-being, and wasn’t faking for a second when I said that I didn’t mind turning back. I like this. 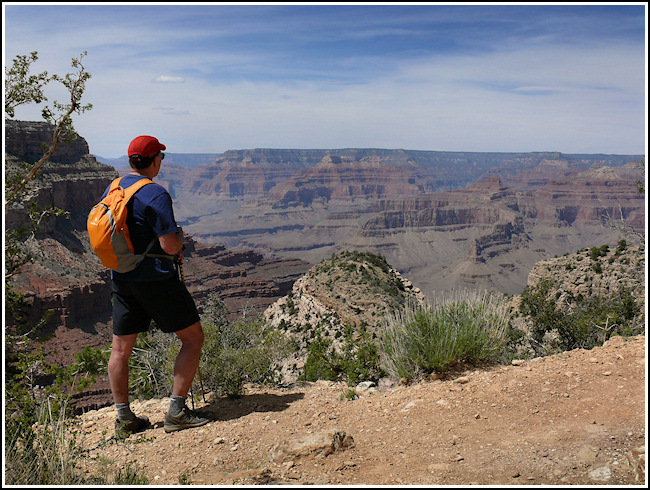 Standard practice in the Canyon is to allow twice as long for the ascent as for the descent. But in our case, it’s not just the heat that saps us, nor really the cardio workout of uphill hiking. The downhills are the killer, especially for Rich and his ailing knees. Downhill tromping even bothers my knees, which occasionally cause me discomfort even though there’s nothing officially wrong with them. So, needless to say, our return hike to the rim took less than half as long as our hike down into Hermit Canyon. We found plenty of shade-breaks from the scorching sun, and returned to Hermit’s Rest in relative ease and comfort. A picnic table awaited us at the top, between the restrooms and Hermit’s Rest building, and we collapsed there for a five-minute break. The Hermit had whipped us almost as badly as Boynton Canyon, but I was more than satisfied. I didn’t want to see Dripping Spring without Rich by my side. We’ll reach it together next time. The time we’d saved by ascending much faster than we’d expected could now be put to good use: searching for a survey mark! 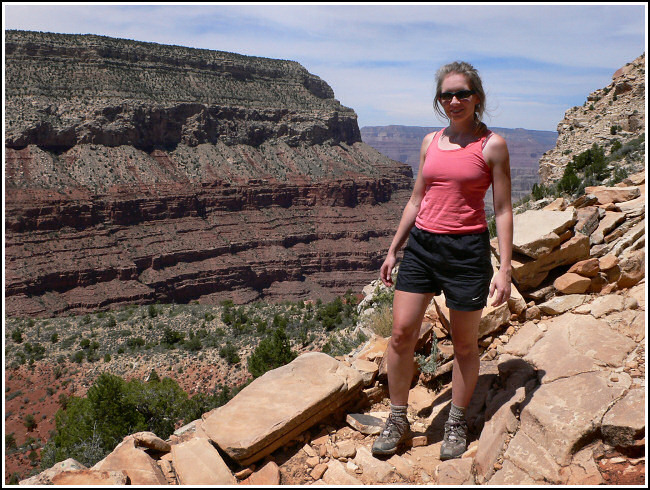 I was desperate to find at least one of the Boston Museum survey marks to add the color of personal experience to my “Resurvey of the Heart of the Grand Canyon” report. So far, our casual searches had been busts. We decided to give HOPI a try, and exited that damned rickety shuttle bus at Hopi Point to have a look around. The mark was right at our feet, on a prominent outcrop , near a monument to Colonel Claude Birdseye. It was also surrounded by sightseers. As soon as I started to photograph the mark, at least two other people barged in and took their own photos, I’m sure “just in case” it was something important. Well, it is, but not to them. Sheep. Tonight’s dinner came from the Bright Angel Restaurant, an even further cry from El Tovar. The food was light and tasty, though, and served in a bright and relaxed environment, just what we needed. We shared the lettuce wrap appetizer: peppery pistachio chicken wrapped in green leaf lettuce and topped with a citrus sour cream. It was refreshing and spicy; I’d love to make this at home! Rich, again in the mood for BEAST, ordered the Harvey House Steak, with the tasty but unimaginative accompaniments of potato, vegetables, and roll. Wanting something light, I chose Harvey’s Spinach Salad with the spicy Serrano Grape dressing. My two pounds of spinach arrived topped with grape tomatoes, egg, bacon and parmesan, mushrooms and sunflower seeds. So much for light! The salad was very fresh, though, and the sweet and spicy dressing was a delicious surprise. Any leftover pains or aches we might have felt were vanquished by the pints of Fat Tire Ale we drank down. We returned to our room well-fed, somewhat beat-up, and thrilled about our adventure and what the next day might bring. We reveled in the peace and quiet and the understanding we can share without having to speak a word.